Accurately portrays the widespread effects of a young lesbian's decision to come out of the closet and live openly and honestly while in high school. My best friend is what? How could this be? Lynn has known Kit since they were twelve years old. Then Kit tells Lynn that she “likes girls.” How could Lynn not have known? Can they still be best friends? When Kit is bullied by jocks, what can they do? 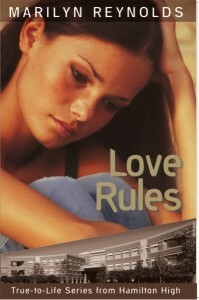 Written with humor, warmth, and understanding, Love Rules is the story of a young woman struggling to understand her best friend’s sexual identity, and what comes next in their lives. Directly from New Wind, Barnes and Noble, Amazon, or your local independent bookstore. Also availabe in Perma-Bound editions and from Follett. Booksellers: available through Ingram Distribution. For bulk orders, see our Bulk pricing order form Hamilton High, or contact orders (at) newwindpublishing.com. Grade levels 8 and up.